We've talked about the United States Lost Decade earlier this year [Mar 26 - WSJ: Stocks Tarnished by Lost Decade] when the market was essentially flat over the past 10 years.... and more recently [Oct 7: Bloomberg - 2000s Stock Market Worse than 1930s] as the market has now lost substantially over the decade. The inference here is we were told "we'll never be like Japan because our economy is so dynamic, flexible, and innovative" - we'd never have real estate bubbles combined with financial bubbles combined with a stock market that went nowhere for a decade. Nope - free markets would never allow that. We're better than that. That's proven to be a farce. For those who are relatively young, Japan was the shining light of the world economy in the latter 80s and many stories were told about how they were poised to take over the U.S. as the dominant economy. They are still #2 in fact, but after a series of bubbles, thrown in with deflation, thrown in with interest rates near 0% for much of the period - they've never regained that former luster. The one place the 2 countries certainly differ is our savings rates - the darn consumers there do not spend over their head day after day, year after year so the domestic economy could roar - so it's been hard to get back to the go go days. Now the conventional wisdom here is (again) we are not like Japan. Once the US consumer has a few quarters under his belt he will go back to his free spending ways. But those same people told you we'd never be like Japan with series of bubbles, stock market that is awful, historically low interest rates (we should be heading back to Greenspan rates of 1% by this week), and deflationary under currents in major parts of our economy (housing for one). That could never happen here. Just like Americans could never be forced to save - whether by choice or not. [Turmoil May Make Americans Save; Worsening Nasty Recession] My thesis is Americans don't WANT to be savers - it is not in our cultural DNA. But what one wants, versus what one is forced to do are two very different things. I'll have a story up tomorrow on the rise of the working poor in Japan - if I put the story on the website and took out the word Japan and replaced it with the United States you wouldn't be able to tell what country they are talking about - it sounds identical... but just remember "it could never happen here". For now let's look at Japan's stock market. 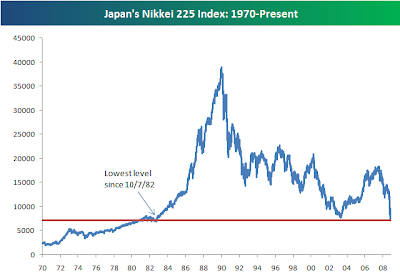 The last time Japan's Nikkei 225 Stock Average was at today's level, headbands and legwarmers were in, Steven Spielberg's E.T. topped box offices, and Michael Jackson's Thriller was about to be released. That was 1982, the fifth year of a rally that pushed the Nikkei to nearly 40,000 by the end of 1989 in an asset bubble that purportedly made the land around the Imperial Palace as valuable as all of California. The Nikkei today slumped 6.4 percent to 7,162.90, the lowest since Oct. 7, 1982. The measure's 53 percent tumble in 2008, fueled by the credit crisis, slowing economic growth and as the stronger yen threatened exporters' profits, has made shares ``shockingly cheap,'' said Peter Tasker, a strategist with hedge fund Arcus Investment Ltd. and Dresdner Kleinwort in Tokyo. Shares on the Topix index, the broadest gauge of Japan's stock market, trade at 0.89 times book value, the first time the average has been below 1, according to Mizuho Securities Co. That means the companies would be worth more if liquidated. Back in 1982, Japan was just hitting its stride as the baby boom generation reached peak productivity. (sort of like the US in the 1990s?) Inflation had been tamed through conservation efforts during the oil shock of the 1970s while the U.S. entered a recession resulting from Federal Reserve Chairman Paul Volcker's 15 percent interest rates. Then came the crash in 1990, followed by a generation of economic stagnation and deflation that ripped apart the lifetime employment system and saw once vaunted companies such as Yamaichi Securities Co. disappear.